MINNEAPOLIS — The defending American League champions were finally reminded what it feels like to lose a game. Kansas City became the last team in the majors to lose this season, as Kyle Gibson pitched into the seventh inning and Oswaldo Arcia hit a two-run homer for the Minnesota Twins in a 3-1 victory over the Royals on Wednesday night. The Royals (7-1) were chasing the 2003 team’s 9-0 start as the best in franchise history. But Gibson (1-1) used 12 groundball outs and three strikeouts to keep the highest-scoring team in the majors quiet for a night. "He had a good sinker going tonight. He was pounding the zone early and when pitchers get ahead like that, it makes all of their pitches more effective," Royals first baseman Eric Hosmer said. Edinson Volquez (1-1) solidified his spot in the rotation with his second consecutive strong outing. He struck out seven in 7 2/3 innings, with five hits and one walk allowed. Volquez, who signed as a free agent after pitching last year in Pittsburgh, now has eight straight quality starts. He hasn’t allowed more than three earned runs in any of his last 14 outings. 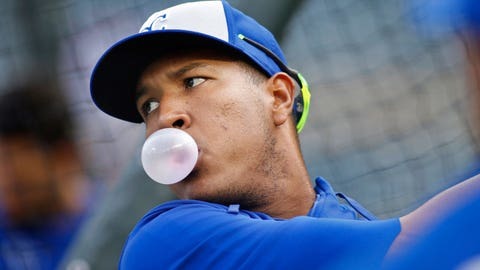 "He’s going deep into games and throwing the ball very, very well," Royals manager Ned Yost said. Volquez pitched out of trouble in the first inning, when he loaded the bases with nobody out. Brian Dozier hit a sacrifice fly, but Volquez retired the next two hitters on infield grounders to limit the damage. But after the Royals tied it in the fourth, Volquez made his only mistake of the night in the bottom of the inning. Arcia sent a two-strike, two-out drive into the seats above right-center field to put Minnesota ahead 3-1. 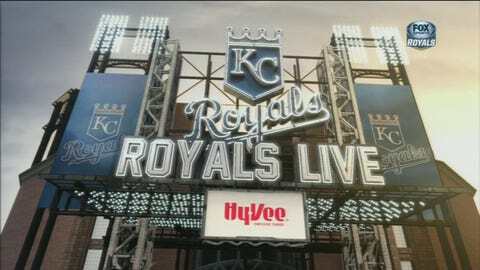 The Royals had their chances, but couldn’t come up with a big hit. Lorenzo Cain bounced into a double play after consecutive singles to start the game, and Salvador Perez grounded into an inning-ending double play by the Twins in the second. Alcides Escobar had three of the nine hits against Gibson and Alex Gordon drove in a run with a two-out single in the fourth inning, but Gibson tiptoed out of trouble all night. The former University of Missouri star improved to 4-0 in four career starts with a 1.38 ERA against Kansas City. Yost decided to keep Cain in center field and replace Alex Rios in right field with Jarrod Dyson, only the second bench player to appear in a game so far for the Royals along with Paulo Orlando. Outfielder Terrance Gore was recalled from Double-A Northwest Arkansas for depth. Rios, who broke the pinkie finger on his left hand when he was hit by a pitch from Twins rookie J.R. Graham the night before, expressed frustration about the circumstance. "It’s frustrating when you get inexperienced pitchers coming to the mound showing a lot of energy and not being able to control their emotions," he said. "I think that’s a recipe for disaster, when you have high-energy guys without being able to control their emotions. And then you put them in high-pressure situations, and they just don’t know what to do and things like this happen." Rios said he wasn’t surprised by the diagnosis, considering how hard the pitch was and the placement of his hand against the knob of the bat. He passed a strength test on his hand, one encouraging sign for a recovery that could take about a month. "I’m going to do my best to do what I can to shorten up the time. It’s going to depend on the bone itself, but I’m going to work on everything that I can to help the healing process a little more," he said. The Royals will send left-hander Jason Vargas to the mound for the series finale on Thursday afternoon to face Twins left-hander Tommy Milone.